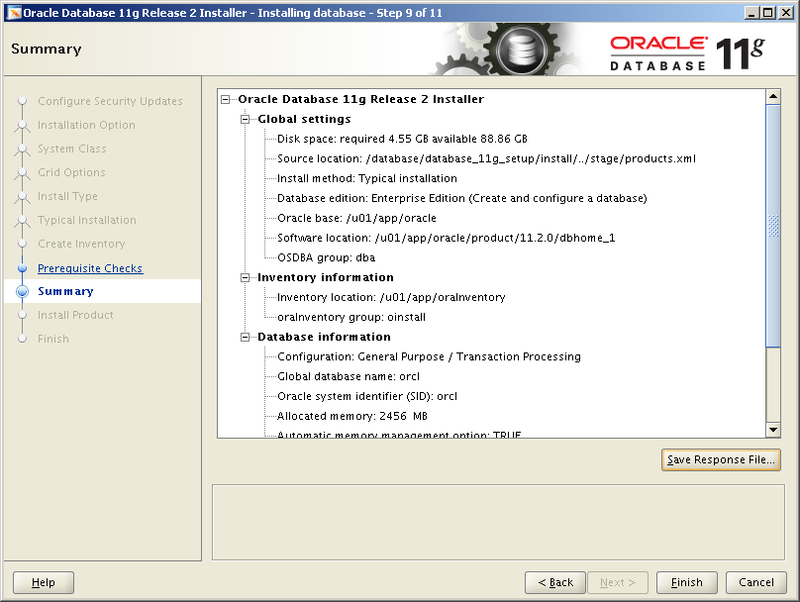 In this article we’ll describe the installation of Oracle Database 11g Release 2 on Solaris 11.1 (x86-64). 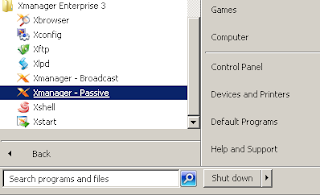 The article is based on a default server installation. Alternative installations may require a different setup procedure. 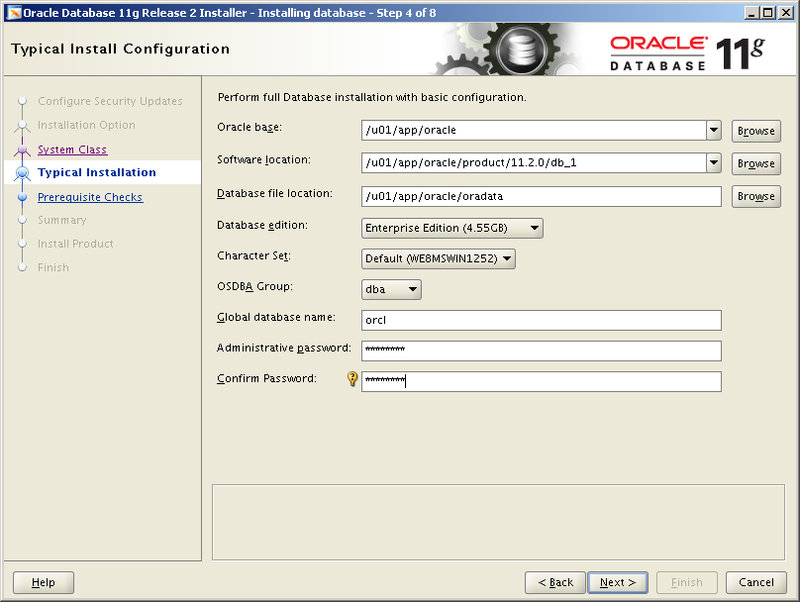 Login as the oracle user and add the following lines at the end of the /export/home/.profile file, making sure you have set the correct ORACLE_BASE value. 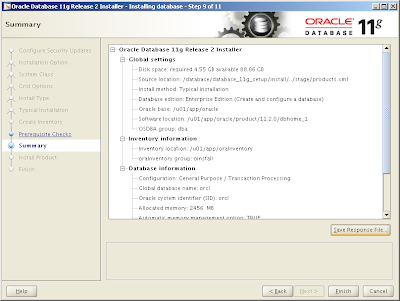 You might be familiar with Oracle installations under Linux. If so, you’d know that part of the preparation stage in getting that right is to configure assorted kernel parameters, so that memory and other system resources are adequate. The same thing happens under Solaris, but we do it in a completely different way: we create a “resource project” in which memory and system resources are specified. 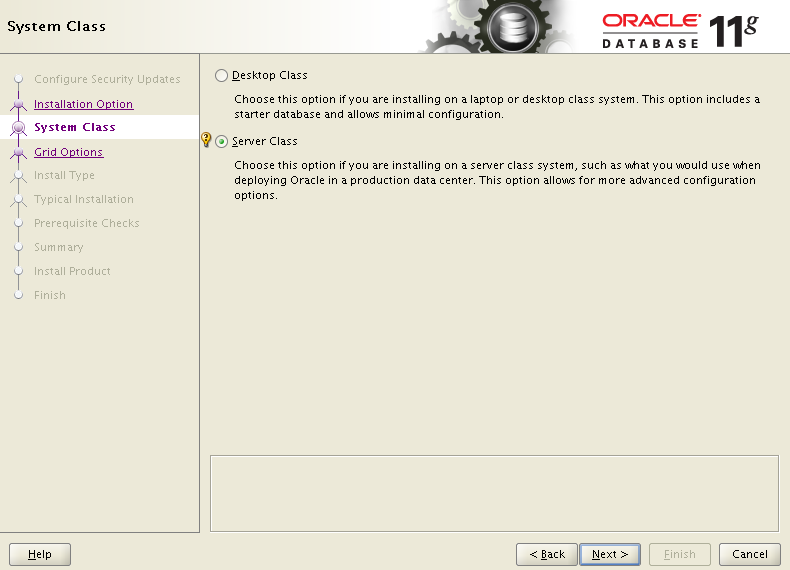 Later, we assign those resource projects to specific users. 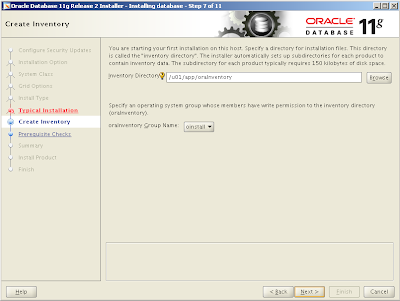 Issue the following command to create resource project and then append following line to the /etc/user_attr file. If you've performed a default installation, it is likely that the only kernel parameter you need to alter is "max-shm-memory" to meet the minimum installation requirements. To modify this value, make sure at least one SSH session is logged in as the oracle user, then from the root user issue the following commands. To check the current value issue the following command. The virtual machine I was using while writing this article created with 8GB memory so I’m actually allocating 50% of the memory to SGA here. The first command dynamically resets the value, while the second command makes changes into the "/etc/project" file so the value is persistent between reboots. Probably the key resource value to set is that first one: max-shm-memory governs the largest size of shared memory segment that the project can create. You set it to the sum of all the SGAs you think you’re going to create on a box, plus some spare for growth. The usual principle is that, after allowing some memory to the OS for its own use, you allocate 50% of your RAM to SGA and 50% to PGA. The SGA value is then what you’d set your max-shm-memory to. For example - I have a Server Machine with 64GB memory. I’d maybe allow 32GB RAM for the server OS itself. That means there are 32GB available RAM. 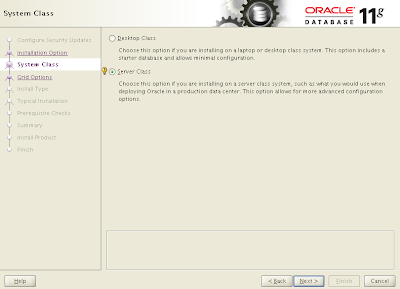 Basic principle then says, ‘allow 16GB for SGA and 16GB for PGA’ so set max-shm-memory to 16GB. You must have already installed Xmanager 3.0 under windows workstation machine and Xmanager passive should be running in order to run Oracle database graphical installation. 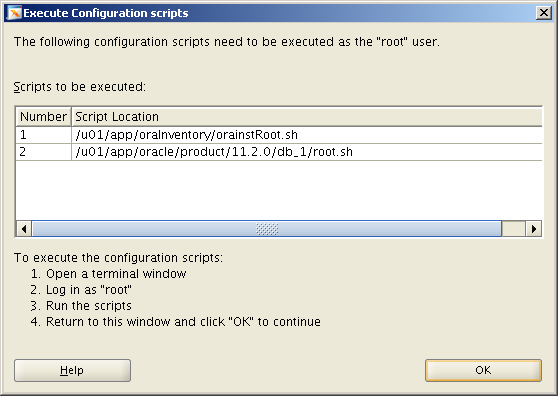 Switch root user to oracle and export Graphical display to your windows Xmanager workstation. You will see this warning about not meeting minimum system requirements, no worry just ignore and Click Yes to carry on with installation. 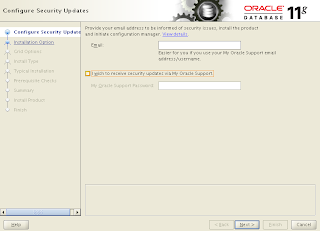 Sign up for email alerts and security updates if you have oracle support otherwise leave blank and carry on with the installation. 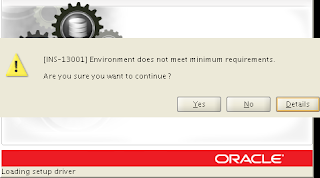 If you switch off the security updates option and click [Next], you will see the following warning; just click [Yes] to move to next installation screen. 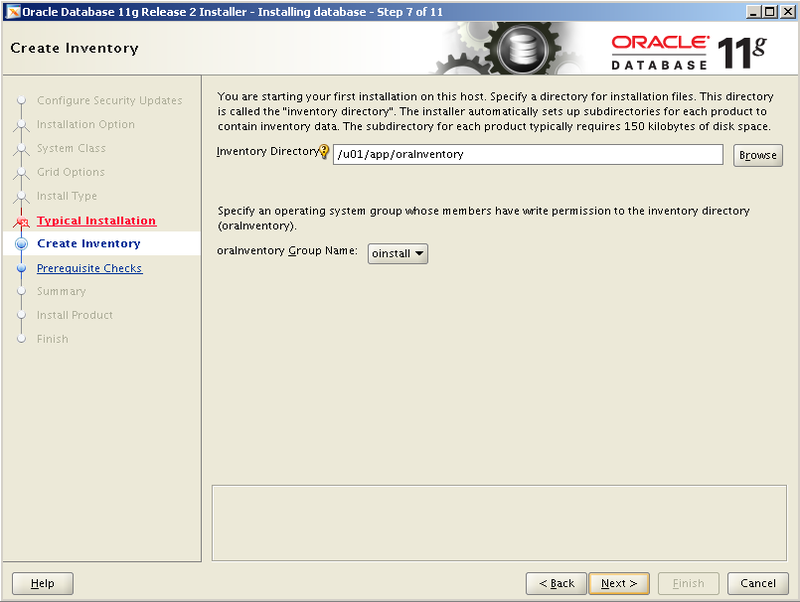 The path to the Inventory directory is again derived automatically from environment variables and ‘oinstall’ is the correct group to owning the OraInvenrory location. 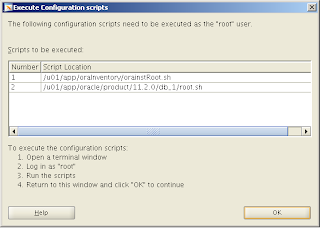 Both of these scripts have to be run as root; don’t click [OK] at this stage. Run each of the scripts mentioned in turn. The first script won’t require any input, but the second script will prompt you for the full pathname of the local bin directory. It will make a default suggestion of /usr/local/bin. This should be changed, by typing the actual path, which is /usr/bin. 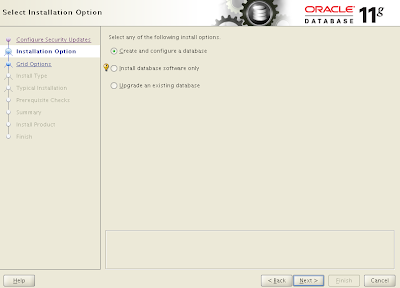 Once both scripts have completed, you can return to the earlier dialog box and click [OK] to close it. 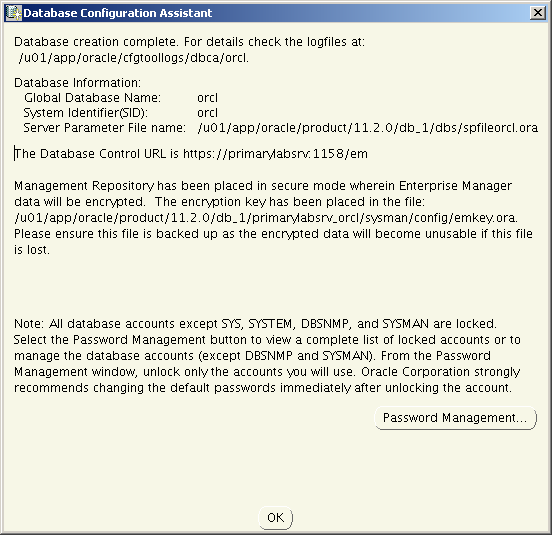 You’ll get one more dialog box contains the URL information of Enterprise Manager Database Control. Just click [Close] and the installation is complete. su - $ORACLE_OWNER -c "$ORACLE_HOME/bin/emctl start dbconsole"
su - $ORACLE_OWNER -c "$ORACLE_HOME/bin/emctl stop dbconsole"
That links in the new script to the Solaris Kill and Startup initialization mechanism. 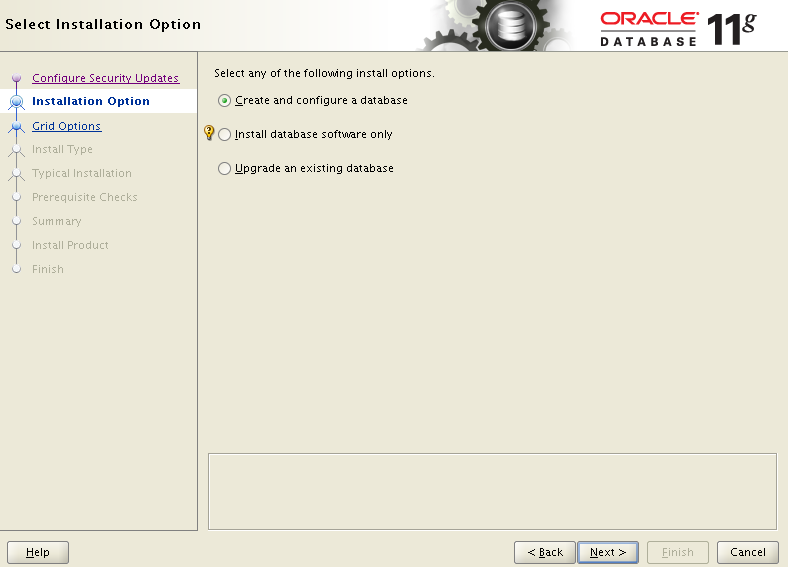 and replace the very last “:N” to be “:Y” (that mean “Yes”, I want the database involved to be auto-started). 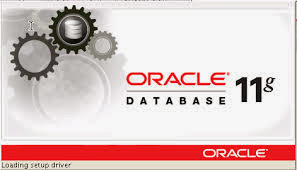 If you reboot at this point, you should be able to log on as the oracle user and immediately connect to a running database without you having to manual intervene at all. 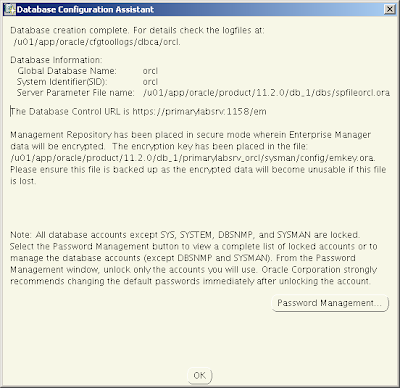 The final step to do in post-installation is to make sure you can connect to the Enterprise Manager Database Control. That should be available at the URL your database machine IP Address or Hostname: in my case, https://172.22.2.100:1158/em as shown in image below.